Topic: My attempt at an text adventure blog. Marathon finished Space Battleship Yamato 2199. Pacific Rim Animated Series! Likely to be a prequel! Orwell is condemning things like "collateral damage" or "downsizing" instead of "civilian deaths" and "firings" -- wishy washy language. But he confuses it with conciseness. Conciseness is a way to avoid wishy washyness, but it isn't the only way. Oh yeah, how did I forget AJATT? It's written for learning Japanese, but can be used for any language. This forum is all about learning multiple languages. Oh, you're taking about that. Here's the thing: he still counts them as irregularities. Whether they're justifiable irregularities isn't that important. They're still counted. There's nothing as drastic as "/i/ instead of /e/" in the page, is there? English spelling is mostly regular, but extremely complex. goofy wrote: Better make that "words which most European languages, and a few other languages, use". True, but that's too clunky for a title. 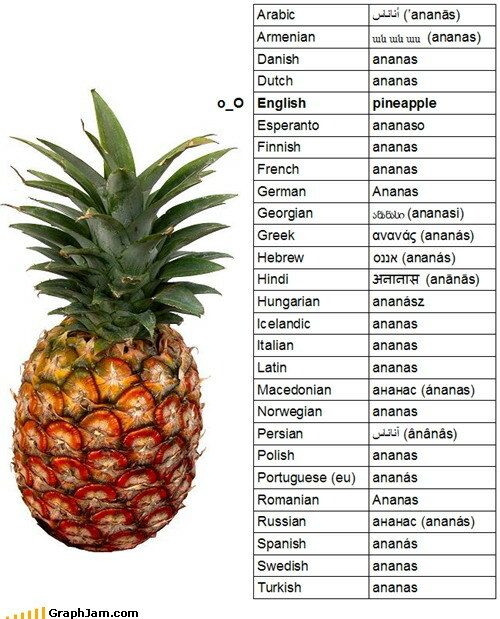 Why doesn't English use "ananas"? Are there any other words like this? Re: Media that mixes three or more languages? Is it me, or is someone changing the topic title? [quote=Velifer]Yes, I've heard. You want something more like Ahmadou Kourouma's novels written in French, Malinke, and his own creole? [/quote]Hm, yeah, this seems more like what I have in mind. Topic: So what's the deal with gendered nouns? Re: So what's the deal with gendered nouns? From what I've heard, most English spelling was standardized through general agreement when printing was invented. Media that mixes two or more languages? In bilingual areas, people tend to switch between two languages while talking with each other (I do this myself, in fact), sometimes even in mid-sentence! I've always wondered if anybody has ever written literature or sung songs that mix languages together like this. Erm, yes. It's just that I would prefer to know whether I'm getting it right, not just imitating recordings. So that is not very helpful. I've been trying to learn the cardinal vowels from this book. I think I've gotten a general idea on how they're pronounced, but I'm not confident whether I'm doing it perfectly right. What should I do now? Topic: Use of commas in sentence list. Re: Use of commas in sentence list. Them thems are certainly dialectal. Iulus Cofield wrote: Whoa, I'd never thought of counting binary on my fingers instead of in my head. That's actually incredibly easy and strangely relaxing. cybermutiny wrote: It makes me think there is some innate tendency for humans to think in 10s. A simpler explanation would be that humans have 10 fingers. English also has a French-like system for counting in base-20, compare French "quatre vingt sept" (lit. four twenty seven) with "4 score and 7 years ago". Topic: How do foreign languages use metric? Re: How do foreign languages use metric? Could a mod change my name to just "cntrational", without the caps? I would be much obliged.